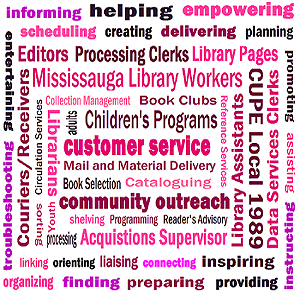 CUPE 1989 represents approximately 400 library workers who work at the 18 public libraries across Mississauga. We have a single collective agreement which covers both our full-time and part-time members. Our members are frontline workers who serve the public directly and behind-the-scenes workers who ensure that we have materials and services to keep our libraries running. Fifty-six percent of our members work part-time. About 20% of our members are librarians. Approximately 30% of our members are library Pages. Mississauga’s libraries work because we do. We are proud of the valuable service we provide to the community, and we are consistently ranked as one of the favourite public services by the residents of Mississauga.